I am concentrating more, doing what needs to be done to feel good and productive. Sticking to a cleaning routine (following Clean Mama's #clutterfree30) and generally trying to make my house feel like a nicer place to be. I think I am naturally optimistic but I do have to work hard at being positive and a clean, organised space really does make me feel so much better. 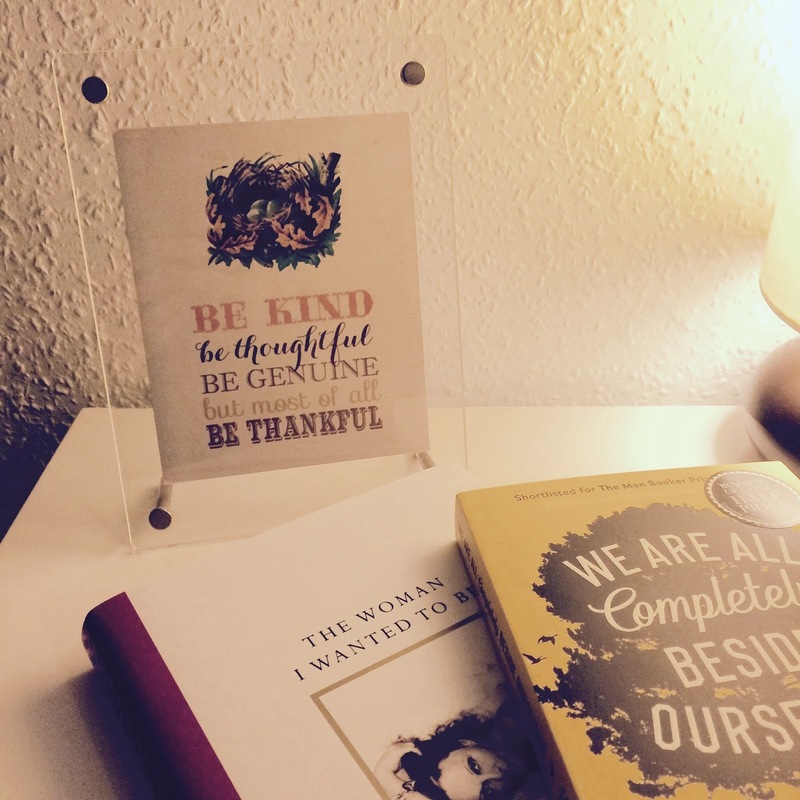 Thankfulness is also something I am mindful of everyday and I decided I would like to have some inspiration to keep next to my bed. I live in a 1930s house and I like mixing up vintage and modern things when I can. So when I saw this free Thanksgiving printable with a sweet nest I decided to frame it and put it on the bedside table, after all that's a nice way to be all year round! I already had this Acrylic Photo Frame (I've had mine for at least 8/9 years I think, but they still sell them at Muji! I LOVE that shop) and I like how it looks. Pretty and simple. It's fun making easy cards like this and good to have them to hand. Not that I go to many parties but the kids seem to have at least one to go to every weekend! I have a habit of being overly ambitious (not necessarily a bad thing) but with family, part-time work and general life stuff, I can't always do as much sewing as I would like! My FAL lists last year were unrealistic and I didn't even manage to link up with the last quarter, even though I think I did manage to finish a couple of things. So new year and a way more focused approach to everything. Listing all the things I'm working on tends to stress me out and there's no point listing three quilts I haven't even got basted and will probably be hand quilting because that's utter craziness (hopefully I can list them when it's time to quilt them and have a chance of getting them done)! 2. Vintage Quilt commission - I didn't make it but I'm hand quilting it, which is a big job! 3. Le Challenge project - this has to be finished by 14th February. I'm excited to get started as I've never used fabric paint before (or not since I was a girl). I got this cream jersey fabric and the gold Dylon fabric paint from Minerva Crafts. This is going to be fun! Nat and I just announced the new theme over at the le challenge blog - so please head over there and follow us. We have a giveaway every month for one person that links up and this month's theme is easy peasy! Sounds like you are a busy girl! Love that birthday card. Remember to show us how the fabric paint works out! Glad you've found some balance - it's amazing the difference it can make! Great projects you've got on the go. That seems realistic! Does the baby quilt involve stretch fabrics, I'm guessing from the photo that's it's outgrown baby garments? Good luck. I love those cleaning printable!! I feel like cleaning in this house is an uphill struggle at the moment! Nothing stays tidy for 2 minutes!! Love the look of those projects, can't wait to see your le challenge one! heading over to Le Challenge now. Lists are funny things, sometimes help us to feel focused and sometimes overwhelming. That's a lovely saying to live by, thank you for sharing it. And what beautiful quilts you are working on! Love those super easy birthday cards too, such a great idea. I love the 'Be thankful' reminder. We are working on not grumbling in our house - and I am probably the biggest culprit. Being thankful really helps!